Dr. House might be a fictional character, but that line from the TV show House has truth written all over it. Everybody lies—plain and simple, a fact of life. There are varying degrees of lying from your little white lies to the whopping, out right and fantastical lies. The funny thing about a lie is that you have to possess a pretty good memory in order to perpetuate it; telling the truth requires no memory of what you’ve told someone. When did we first learn to lie? As small children, our parents started the telling of sweet little lies to get us to listen, stop crying and ironically, to trust them as our caregivers, authoritarians and guardians through life. When I was a child I was deathly afraid of thunderstorms and was always fearful my family would be taken away by a tornado. I remember my dad telling me that as long as it was raining, a tornado could not form and hit us; a little white lie to calm me down as a child. My mother used to tell me if I ate the bread crust on sandwiches that I would get curly hair; another white lie to get me to eat all of my food. I really wish that wouldn’t have been a lie; I still have stick straight, stringy hair to this day. Our parents perpetuate the lies of Santa Claus, the Tooth Fairy and the Easter Bunny. My older siblings used to scare me with tales of the Boogie Man, saying he was under my bed, so I had better not get up during the night or he’d grab me. Elders often exaggerate stories to teach us a lesson; stretching the truth is in essence lying. These sweet little lies are told for our own good help us to grow into well-formed and adjusted adults. As children we start lying to avoid punishment or scolding from our parents and teachers; even when it is more than obvious that the fault is with us. Some even start to fabricate imaginary friends to take the blame. My imaginary friend Ashley was short lived; she was a very bad girl that broke one of my mother’s Currier and Ives bowls. Throughout our teen years, the lies begin to grow and we hone our skills at concocting them. The lies to my parents got to be more elaborate and grand towards the end of my high school years; I had become a master of the lie. I remember once, my mother asked me why I was so late coming home and I decided to actually tell the truth; she didn’t believe me. I instead fabricated this crazy story, and she believed that instead of the truth. The capacity to lie is equal to the believability of the one we lie to; although a lie is still a lie whether or not the one we are deceiving believes us or not. Sometimes lies are a necessity in life. One of the biggest lies I ever propagated was when I was nineteen years old and had to keep my pregnancy hidden from my parents; not revealing the truth in its entirety is considered a lie. I eventually came clean and told my parents, but I needed to lie for a period of time to be able to go through with my plan of placing my daughter in an open adoption and giving her a better life. Once we reach adulthood, some lies are told to help us save face or to not feel inadequate to our friends and family. We start the cycle of lying all over again when we have children and tell them those same sweet little lies we were raised to believe and groomed to pass on. There comes a time when we start to differentiate between the little white lies and the bold and brazen lies; unfortunately some blur those lines and take the path to becoming pathological liars, living a life of lies and half-truths. If someone is going to lie about little things that have no meaning, imagine what they are capable of in important matters. It is sad event when someone starts to believe their own lies; the lying then turns into a deeply seated psychological condition. I’ve had the misfortune of knowing a few people like this over the years; you cannot believe a word that comes out of their mouths, they can look you straight in the eyes and lie to you. What it all really comes down to is trust. Trust is sometimes easily given to someone; this is especially true for me. I trust that any person I chose to let into my personal and intimate space will always be as honest with me as I am with them. I’m not going to fault someone for a few little white lies here and there. If I were to say right now I never lie, I’d be lying; however, when it matters you can count on me to be 100% honest about my feelings. Perhaps I am a little too trusting; I have been badly hurt in the past by believing lies. There have been quite a few times that even after someone offers an apology to me for lying, I give my trust back to them; I almost always end up getting burnt all over again. I like to give others the benefit of the doubt, because I always try to envision myself in their position; truth be told, I would have never told some of the lies that others have deceived me with. I suspect that deep down inside we want to believe lies that certain people tell us; I know I do. I remember when a man I was in a relationship with was caught in a lie while he was drunk; alcohol is sometimes just as good as sodium pentothal for bringing out the truth. When I asked him if he was lying, he looked right into my tear filled eyes and reassured me he wasn’t lying to me. That was the biggest lie of all, and I knew it in my gut; I should have left him right then and there, but I didn’t. I chose to ignore the truth that my instincts were telling me and instead I believed his lies. I lied to myself to continue the relationship. I believe that people for the most part are honest and only lie when absolutely necessary. I still give my trust too freely and sometimes end up disappointed. I tell white lies to keep my day job and to appease the masses. 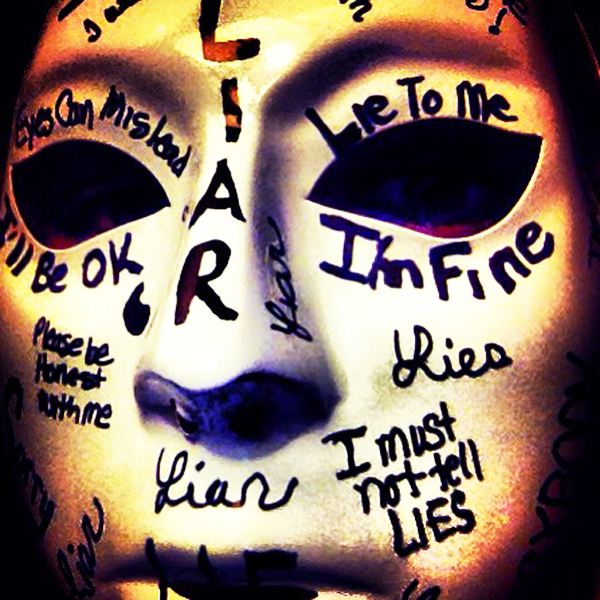 I tell myself lies to keep me happy during times of stress and strife. After everything is said and done, Dr. House wasn’t lying: everybody lies, and that’s no lie. Laura Bock is a freelance writer and photographer. She is an old school punk and alterna-chick that prefers wearing her Doc Martens over a pair of heels. She’s recently learned to de-clutter and simplify, so that she might pursue the life she so desperately craves. Her passions are writing, travel and photography. You can connect with Laura on Facebook, Twitter and her blog, Tales of a Formerly Inadequate Fat Girl.